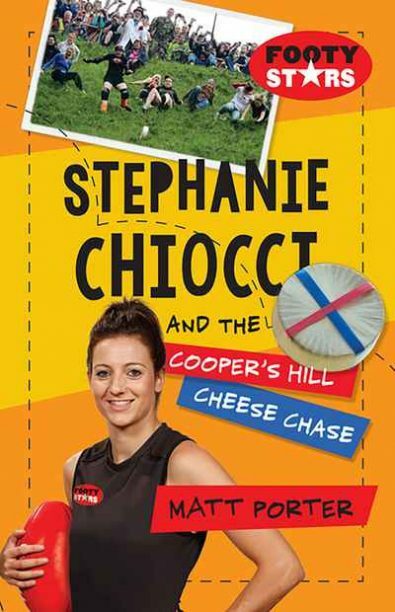 Stephanie Chiocci, captain of the Collingwood AFLW team, is taking some time away from footy training to compete in the Cooper’s Hill Cheese Chase in England—a race to catch a cheese down a steep hill. Steph is ready for the challenge, but a family business is on the line and rival cheesemaker Neville O’Shea is up to some unsportsmanlike tricks. While Steph’s ball skills might be excellent with a Sherrin, this round, rolling cheese is proving very unpredictable. Setting a story about Aussie Rules in England seems almost as bizarre as the cheese chase event itself, but Matt Porter delivers the right amount of madcap adventure and comedy alongside a message of teamwork, determination and resourcefulness. It might just be Steph’s footy skills that were needed all along! The first in a new series featuring stars of the AFLW, this book is sure to be popular with the upcoming season return. Suitable for a middle-primary audience, it will appeal equally to footy fans and to readers looking for a laugh-out-loud escapade. The resulting story is both fun and action packed, complete with football tips from Stephanie Chiocci herself.